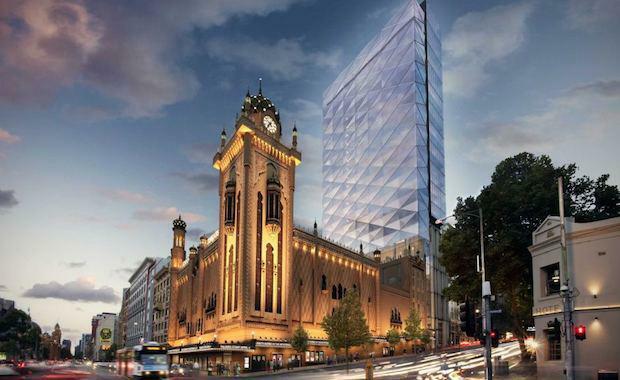 Melbourne's historic Forum Theatre will undergo a $100 million redevelopment including a 32-storey hotel after The City of Melbourne gave planning approval, with a number of tweaks on the original plans. The council originally opposed the plan in May due to concerns about heritage, design and height, and the impact on street art on Hosier Lane. Planning Minister Matthew Guy said the final planning permit reduced the affected area of Hosier Lane from 16 metres to 3 metres. "People shouldn't be concerned about any encroachment on street art, because it will virtually all remain - 99 per cent of it will still be there as it is now," Mr Guy told ABC. "For those concerned about height, I say that this is an area that will not encroach over the Yarra River. "It's a relatively small development in terms of height, it's a lot lower than buildings that surround it, and people shouldn't be concerned about the height of the building. "The upgrade will include a boutique hotel with office and retail space at the back of the building with a pedestrian link to Hosier Lane.The hotel development will help fund the restoration of the Forum Theatre. The plan was developed by the Marriner family, which owns the Forum Theatre as well as the Regent and Princess Theatres. Construction work is due to start early next year and the project is expected to be completed by early 2017.